1) Testing multi-player can be a pain because you have to wait for the game to check the version before it lets you continue to load the game. It can sit up to 20 seconds or more just waiting for an answer before it finally drops through and lets me test the module. It does not always do this, but it does it enough to really hamper testing. Ironically, one of the other aspects of getting a new computer was to speed up testing. If anybody knows how to bypass this check, or decrease the check time, then please let me know in the comments. (*) All these differences are coded to enable a player to have more direct control over specific companions of their choosing; much like playing more than one PC. 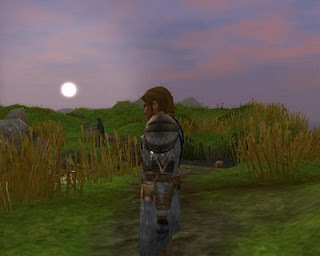 However, I have been able to make use of the default workings to ensure the companions act as a member of a party as well as specific companions in the control of one player. During some of my testing, I took a screenshot as the PC looked across the Borantan Plains. I thought it looked quite good, considering area design is definitely my weak spot. I can also report now that I have managed to script my first cutscene. Geoff Cordery (a.k.a. Quillmaster) came up with one of the voices for me, and I have managed to get the scene in place. Thanks for the voice-acting Geoff; there will be more to come. ;) By the way, if anybody else fancies a part of voice-acting, then please let me know via a comment. After recognising how much work is involved with voice acting and lip-synching, I have decided that I will probably only keep voice-acting to cutscenes and (perhaps) the odd conversation that may add some drama. I also started to look at the Influence System that came with MotB, in the hopes I may be able to use that system instead of my own idea. However, after trying to trace back how the figures were sent to the GUI, I had to give up. I still don't know enough about some GUI code and the influence code that Obsidian used was buried too deep for me to keep trying to uncover. Just before I decided to buy and build a new computer, I had started to try some work with Gmax. Even installing the program and adding the NWN plug-in was not best explained and required careful attention. Thankfully, by the time I was actually able to go through a tutorial, I think I can begin to see how making certain placeables may be achieved. However, I have put that project on hold for the time being, as I believe I need to start doing more NPC and conversations ... and other basic building first.